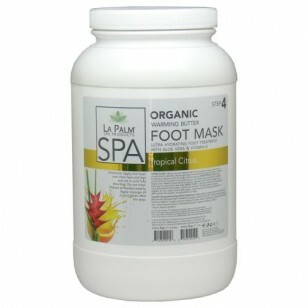 An warming mask and ultra hydrating foot treatment formulated to condition and hydrate skin throughout the day. The exclusive blend of essential minerals helps regenerate and revitalize skin texture and appearance. 1 Gallon bottle with a Tropical Citrus scent. Directions: Apply thin layer over clean feet and legs and rub in until fully absorbed. Do not rinse. Repeat as needed weekly. Apply massage oil or foot lotion after this step.